The New Moon on January 16th is a Micromoon, meaning its orbit is at the farthest point away from the Earth. This is something you may not notice, as the New Moon is traditionally not visible (it rises and sets with the Sun). Image by Lucia Loiso, www.lucialoiso.com. but celebrations begin at sunset February 1st. ​but celebrations begin at sunset February 3rd. Please note that each source may vary the exact time of each phase by a minute or two. I use the Moon Phases tables in TimeAndDate.com as a standard reference. This is a great source, and can be customized for your location. The major phases of this lunar journey are noted above, and you may want to note these in your Moon Chart or journal. This time between Winter Solstice and Imbolc is so precious to me. It is a time of rest and regeneration, of reflection and the birthing of new ideas for the year. Many think of this as a still time, a frozen time, when Mama Earth herself is in hibernation awaiting the sunshine of Spring to bring forth new life. And although An Cailleach still watches over us from the frozen north, our world is full of life and growth. The signs are there, if we pay attention . . . if we use all our gifts for listening and sensing. Yes, the Earth may be frozen (at least here in Vancouver, Canada) but, from deep within, the heat of Mama Earth’s core reaches up, warming and nourishing the seeds and roots while the ground above is cold and covered in deep snow. And at each sunrise, the day is just a little bit longer, waxing towards the longest day of the year at Midsummer. And for my friends south of the Equator, Father Sun is now in his waning phase. 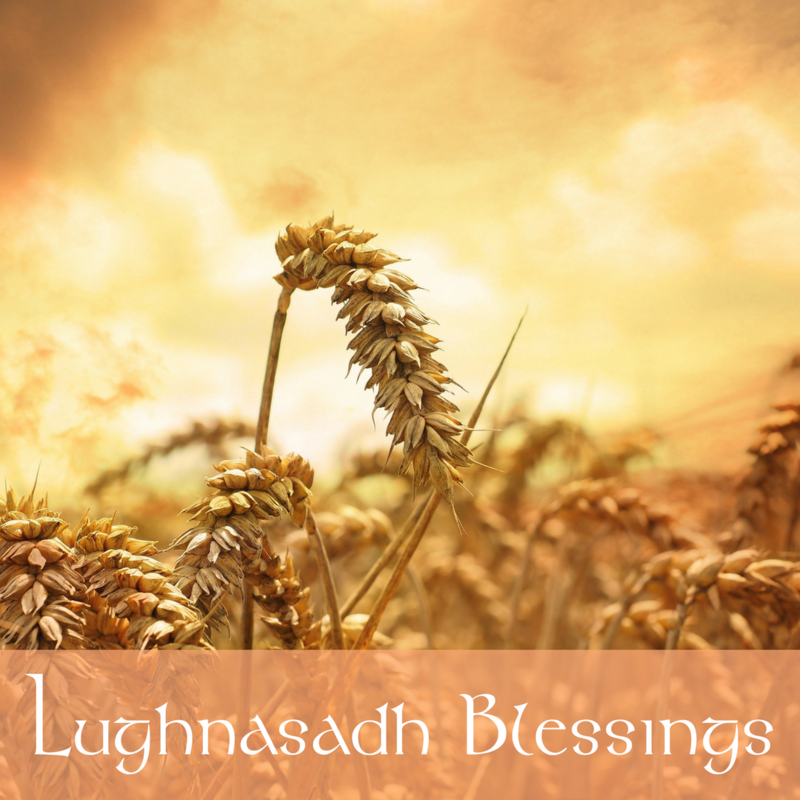 The days are just a little bit shorter each day, and Lughnasadh (aka Lammas) is the first of the Celtic Autumn sabbats. There is a lovely Irish story about An Cailleach (The Hag of Winter) and Brighid (the goddess of fertility, creativity, the forge, blacksmiths and smithing, light, and livestock) who we celebrate at Imbolc (pronounced IM-olk) on February 2nd and/or 4th. On Imbolc Eve, An Cailleach journeys from her sacred northern rocks out to a magical forested island, to replenish her fuel. There she finds the Well of Youth and, at dawn, sips its crystal waters, transforming her from the Crone to the Maiden, to Brighid herself. With her magic, she transforms the world around her. The trees send out their buds, the sap begins to rise, the plants emerge from their seeds and the animals become fertile. ​including rituals, daily practices, Soul Work and more. for an even more in-depth approach and support from those also following this path. ​My suggestion for you is simple: raise your awareness to the changes in Mama Earth this month as we approach Imbolc in the Northern Hemisphere and Lughnasadh in the Southern Hemisphere. I invite you to use all your physical senses and your intuitive senses. ​Get out in Nature, to a favourite "sit spot" or a specific section of your garden or local park. Revisit your spot throughout the month. Observe the trees, the plants, the birds, the insects, our four-legged friends . . . and the sky, the moon, the sun. Whatever captures your imagination. Note what captures your attention. It might be new growth, new animal visitors, the temperature, the length of day, the humidity or dryness. Use all your senses: breathe deeply and sense the aromas around you; listen carefully to the changes in bird songs, to the buzz of the insects. 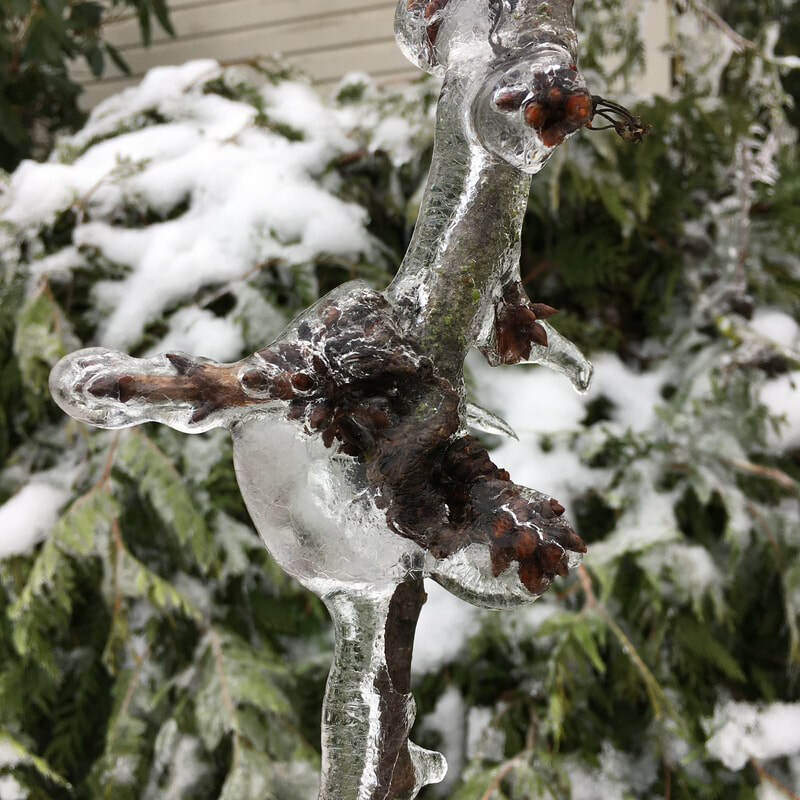 Fruit trees encased in crystal ice. If mobility or getting outdoors is a challenge, spend some time each day looking out your window(s) or team up with someone who can support you in this. As I was walking in Nature during the 12 Days of Solstice, to find my 12 Omens for 2018, I saw so many signs of the transformation and growth: some early tiny buds on the cherry trees, new growth on the pine trees, vibrant green grass under the snow being foraged by our four-legged friends and the gentle beginnings of sap rising in the trees. And for my friends south of the Equator, you have likely noticed that Father Sun is now in his waning phase. The days are just a little bit shorter each day, and Lughnasadh (aka Lammas) is the first of the Celtic Autumn sabbats. The leaves may have started to change colour or even fall, the crops are ripening for harvest, the trees are bearing their fruits and berries. Animals may be storing food for the coming winter, and the birds, butterflies and whales may be starting their long migrations. And as you notice the changes from day-to-day and week-to-week, raise your awareness to your own energy, how it reacts or aligns with what is happening with the world around you. Reflect on your energy cycles, how you sleep and eat, how often you exercise, how you feel waking up in the darkness vs the light, or how you feel in the warmth or cold. Capture your findings and impressions in your journal, along with photographs or drawings. ​write a poem, sing a song, paint, craft, create an offering or blessing. 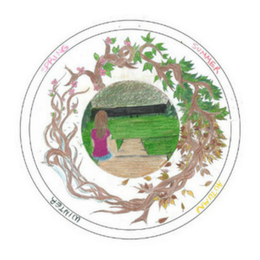 ​You could also create a Phenology Wheel to capture your environment and its changes. What is a Phenology Wheel? Phenology, ​per Wikipedia, is "the study of periodic plant and animal life cycle events and how these are influenced by seasonal and interannual variations in climate, as well as habitat factors (such as elevation)". . . a succinct description for what I described above in a rather long-winded fashion! 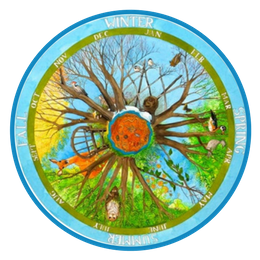 A Phenology Wheel can be used for any period of time, from a week up to a year, and can be used in many ways. What I love about this concept is that it challenges our linear approach to time. By encouraging us to capture our observations and environment in a circle, we can (re)connect to the Wheel of the Year, see patterns over time, and make new connections or gain insights into the relationships between the elements, the flora and fauna..
To explore this concept further, there are some great on-line resources. Check out the Wheels of Time and Place, created by Partners In Place. Their website offers a variety of free downloadable wheel templates and instructions. Cheeky Magpie offers free downloadable lunar phenology wheels, representing all the days in a lunar month (so many ways to use these!). Both are highly recommended! At the New Moon, I reflect on the past lunar journey and note my reflections in my journal. 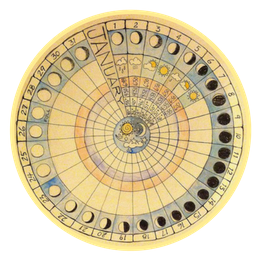 And over the three days of the New Moon, I typically start a new monthly Moon Chart and pull oracle/tarot cards for the month, often using the New Moon Medicine Wheel layout or other spreads. If I haven’t already chosen a theme for the month, this also supports that decision. 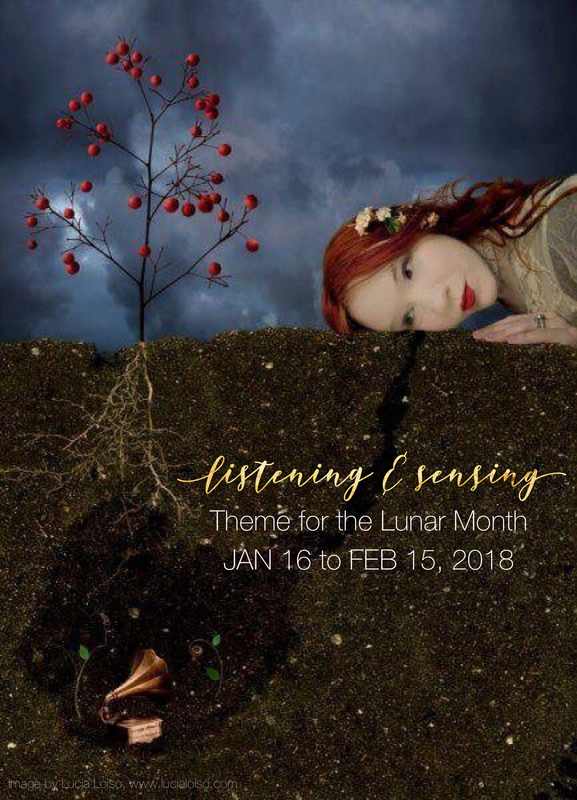 This month our theme is Listening & Sensing. Perhaps this resonates with you, or perhaps your own New Moon soul work will guide you to a choice that resonates even more strongly with you. You may also find that this leads to choosing your WORD OF THE YEAR for 2018. Mine came to me during the 12 Days of Solstice ritual: Alchemy. This New Moon is in Capricorn, and is the first New Moon of the Year. It's also the last New Moon before Imbolc. So my Soul Work suggestions for you are simple this month. As you embrace the theme of Listening & Sensing - and hopefully enjoying the walks with nature associated with that - contemplate on your theme or word for 2018, what you would like to manifest, and how Brighid can support you in that. After all, she is the goddess for fertility and creativity. In this deep reflective energy of the Dark / New Moon, go to sleep with the intention of connecting to that deep subconscious wisdom and to Brighid. Remember your dreams upon waking. Set an intention each night of the Dark Moon before you sleep, inviting your guides, ancestors and Wise Self to communicate in your dreams, with information for your highest good and direction for your next adventure!  What questions - or answers - came up in my dreams?  What resonated with my heart and soul?  What symbols or messengers were given by Spirit or by my guides?  What theme or word for 2018 emerged?  What wisdom emerged about new goals, new directions, new ways of interacting with the world in this New Moon energy?  Where and when do I need to Listen more . . . Where and when do I need to use my Senses more . . . Where and when do I rely only on my rational conscious mind rather than my intuition and deep inner wisdom ? You could also do this as a meditation or journey. Using the basic four questions in the New Moon Medicine Wheel Layout (a practice I learned from Karen D Crane), I invite you to create your own Soul Questions for this Lunar Journey, based on the Four Directions and Elements and keeping in mind the theme of Celebration. 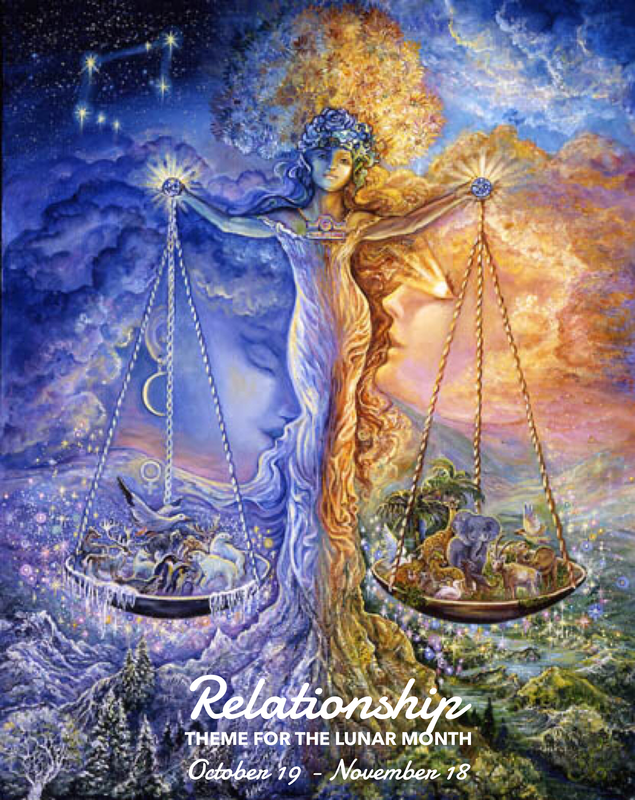 Intuitively choose one or more oracle or tarot deck(s) for this reading. First choose a card as a Signifier, to represent YOU in this journey, then choose four more cards, starting in the East to answer these basic Soul Questions.  In the Centre: Who am I? How can I use the wisdom and guidance of the Crone to guide and transform my journey this month?  In the East, Air, First Quarter Moon: What is beginning?  In the South, Fire, Full Moon: What is flourishing?  In the West, Water, Third Quarter Moon: What is transforming? At each new phase of the moon, pull additional cards to expand and illuminate the wisdom. At each phase, journal your observations, feelings and wisdom gained in this lunar journey that began with the New Moon in Scorpio. Revisit the spread at the next New/Dark Moon, and use the wisdom and insights gained to prepare for your next lunar journey. One of the constant companions in my soul work throughout the year is my Moon Mná Diary Journal, created by ​Karen Ward and Bernie Sexton. This beautifully designed Diary-Journal has 272 pages with lots to read – practical tips, inspiring women’s stories, Irish language proverbs, quotes and affirmations, as well as 12 mindful colouring-in pages. I was delighted when Karen asked me to contribute a short piece to the 2018 edition. As a graduate of Karen's Moon Mná Women's Celtic Circle facilitation program, I was honoured and, of course, contributed! It's not too late to order the 2018 edition and it it can be shipped worldwide! draw cards for the New Moon Medicine Wheel layout, or any new moon layout your prefer. And this Dark Moon/New Moon also is the time to complete the PREVIOUS month’s journey . . . your own Moon Lodge of reflection on the journey, and noting the wisdom gained. 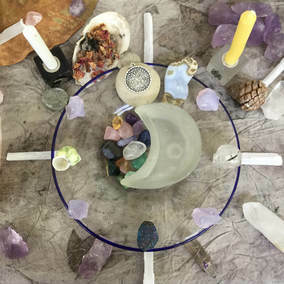 begin a Moon Wheel Chart to track your energies/flow (and other markers that are important to you) throughout the lunar journey. You can read Shekinhah Mountainwater's original Moon Wheel Calendar here. And there are many other ways to celebrate the New Moon, the new lunar journey. For instance, I start many new herbal medicines at the New Moon, to use La Luna's rising energy to extract as much as possible from the plant. Do YOU have any Moon practices you would like to share? or the Bean Gealach Circle (open to all) page on Facebook to share your thoughts. In the Circle, we go into this work much more deeply throughout the month and the year. 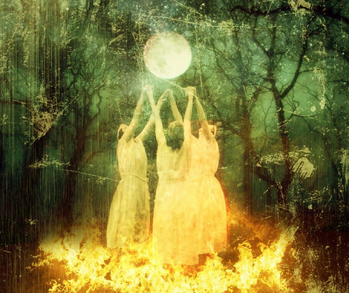 The Full Moon is associated with the magick of completing, healing and empowering. . . and for creating the magickal life you want. Many practitioners choose to do a Release Ritual on the Full Moon, although my personal preference is to release when Grandmother Moon is firmly in the Waning Phase of her journey. But if it feels right for you, do it. Sometimes we need that Full Moon power to energize our release! The Inner Journey Events blog has several posts on Release Rituals using the elements of Air, Fire, Water and Earth. I change it up throughout the year, sometimes using the element of a particular season (Water in Autumn, for instance) or aligning with the element associated with the zodiac sign of that particular day. What else can you do at the Full Moon? ​Remember that the Full Moon energy is with us 2-3 days either side of the actual Full Moon, so there is plenty of time to fit in any of these activities. place your crystals on a windowsill in the moonlight for charging. You can also place them outside. If you are not sure of their porosity or if they are water safe, cover in a clear glass bowl; this will also likely keep them safe from curious birds and squirrels! make a jar of Moon Water for future rituals. If it's your rainy season, place an empty jar outside to collect the pure fresh rainwater. If not, simply fill a jar with pure water, cover, and place it somewhere it can absorb the moonlight. 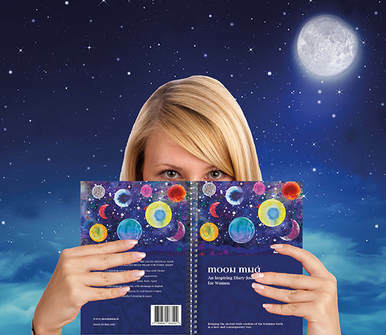 get creative (the Full Moon is a potent time for creativity!) and make a Moon Candle for your altar or rituals. This can be as simple as carving the phases of the moon onto a white pillar candle, anointing your candle with a blessing oil, making a collage on a prayer candle (the kind with a glass column)... or wherever your creativity takes you. connect with the Moon with a Drawing Down the Moon ritual (I love this one!). This can be done alone or with others. celebrate with divination . . . make a pot of tea and share tea leaf readings . . . get out a favourite tarot or oracle card deck and get some inspiration to "shine a light" on any challenges in your life. follow up with a little magick or spellcrafting. The Full Moon is ideal for spells for completing, healing, empowering and banishing unwanted influences.